Up From the Top: How much is enough? With all of the recent financial turmoil in the USA it seems that folks are always talking about the causes and solutions. While reading opinions and comments about greed and capitalism I have seen allusions to an apocryphal remark which has been variously ascribed to at least two members of the Rockefeller clan as well as to JP Morgan. The gist of it is that when asked by a reporter "How much is enough! ", the interviewed financier replied "Just a little bit more!". The last week I have been unhappily musing about the long stretch of winter weather that we have been enduring. Apparently the "Just a little bit more" remark has been lingering in the back of my mind. I have come to repeatedly ask no one in particular -- HOW MUCH IS ENOUGH!, and the unpleasant conclusion seems inevitably to be --- JUST A LITTLE BIT MORE. The thaw we experienced last week served to buoy hopes of getting out and about soon. I had even put out two of my letterboxes, and made plans to plant several others, as well as preparing to seek several that I have been anxious to get. These hopes and plans have been dashed upon the rocks as more snow and cold Arctic air found it's way into our region. 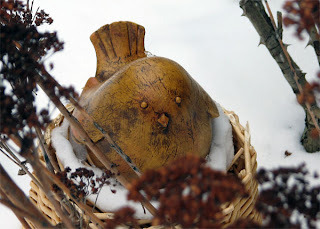 My recently planted box Marge, and her temporary coop mate Bart, are now embedded in snow and struggling to stay warm as winter has returned. I am unlikely to get out letterboxing anytime soon. This must by the curse of the groundhog!